The criminal-justice record of Neil Gorsuch is not as bad as you would expect. 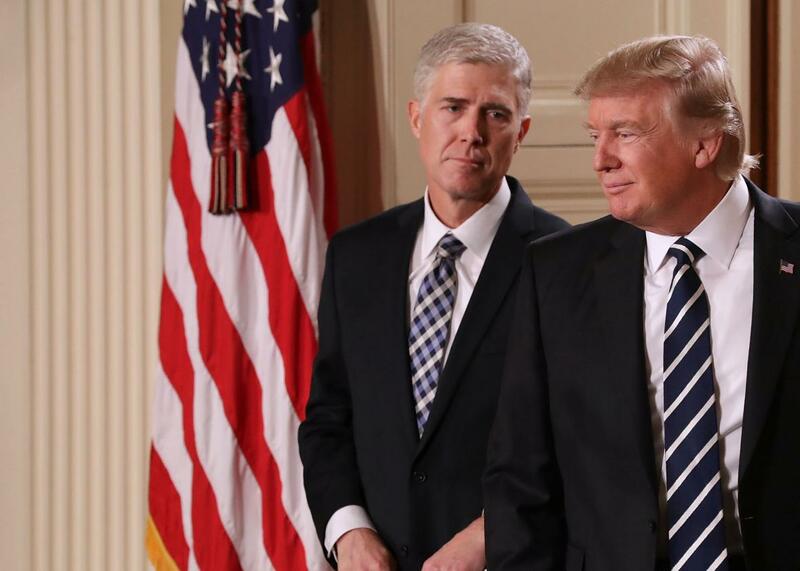 Judge Neil Gorsuch and President Donald Trump. Donald Trump got himself elected in part by acting not just tough on crime but merciless. The guy loves the police and hates anyone who’s even been accused of breaking the law—thinks they’re disgusting and dangerous and don’t deserve an inch of sympathy no matter the circumstances of their offense. This is what it means to be strong in Donald Trump’s mind—a reflection, it has been persuasively argued by historian Rick Perlstein, of the formative years he spent fearing for his life in New York during the bad old 1970s and ’80s. People sit in prison because our circuit’s case law allows the government to put them there without proving a statutorily specified element of the charged crime. Today, this court votes narrowly, 6 to 4, against revisiting this state of affairs. So Mr. Games-Perez will remain behind bars, without the opportunity to present to a jury his argument that he committed no crime at all under the law of the land. Maybe my expectations have sunk too low since Inauguration Day, but even just the premise of those sentences—that putting someone in prison is undesirable and that putting someone in prison who doesn’t deserve to be there is more likely unfair than fine—feels somewhat reassuring. At a time when the nation is urgently reckoning with the problem of police violence and misconduct—and a time when the president and his likely attorney general are on the record as being proudly hostile toward critics of police—one would like to see a Supreme Court judge who is at least capable of seeing fault in the behavior of law enforcement officers. Gorsuch, it seems, does have an open mind on that point, not just because he takes seriously Fourth Amendment protections against unlawful search and seizure but because even the decisions in which he has ruled in favor of the police are argued with humility, instead of being informed by the Trumpish dogma that law enforcement officers are never wrong. On criminal justice issues, at least, it could have been worse. Let’s just hope Trump doesn’t find out between now and the confirmation. *Correction, Jan. 31, 2017: This post originally misspelled Igor Volsky’s last name. Read more in Slate about Supreme Court nominee Neil Gorsuch.